Forrest Cowles Sagendorf (March 22, 1915 – September 22, 1994), better known as Bud Sagendorf, was an American cartoonist, notable for his work on King Features Syndicate's Thimble Theatre Starring Popeye comic strip. Born in Wenatchee, Washington, Sagendorf was three years old when his father died. He arrived at age three in Santa Monica, California with his sister Helen and his mother, who opened a beauty parlor. It was Helen who gave him the nickname Bud. His first job was as a newsboy, selling the Los Angeles Herald-Express on the street. He began his cartoon career while a teenager, working for $50 a week as the assistant of cartoonist E. C. Segar on his Thimble Theatre and Sappo comic strips. 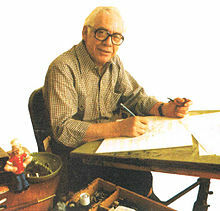 Following Segar's death in 1938, Sagendorf moved to New York and began illustrating marketing materials for King Features, while also developing Popeye toys and games. In 1940, he married his high school sweetheart, Nadia Crandall, and they eventually moved to rural Connecticut. 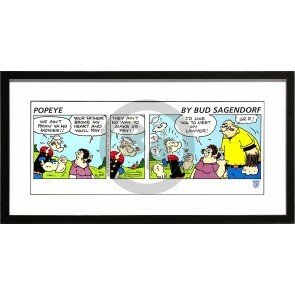 From 1948 to 1962, Sagendorf was the writer-artist of Dell's Popeye comic book. In 1959, he finally assumed command of the Thimble Theatre comic strip. He continued the strip until 1986. Wanting to spend more time with his family and confronted with failing eyesight, Sagendorf reduced his output to Sunday strips while Bobby London continued with the Popeye dailies. Sagendorf wrote and drew the Popeye Sunday strips until his death. King Features continues to run reprints of Sagendorf's daily strips, while artist Hy Eisman writes and draws new Sunday strips. Sagendorf was 79 when he died in Sun City, Florida in 1994 of brain cancer, survived by his wife, Nadia, and three daughters.